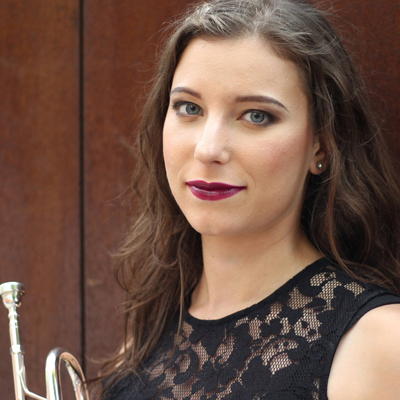 A passionate and creative performer, Kate Amrine is a prominent young trumpet player balancing a multifaceted career from developing new repertoire and curating concerts to freelancing with many different groups in the New York City. Recent past performances includeshows with Wordless Music Orchestra, Ensemble LPR, two solos with an orchestra in Japan, and a show at Carnegie Hall with the new Wavefield Ensemble. Upcoming performances include an off broadway run of Duncan Sheik’s new musical “Alice by Heart” and various gigs with brass ensemble eGALitarian. Kate is extremely dedicated to commissioning and performing new music, premiering over 30 pieces both as a soloist and a chamber musician. Kate’s debut album “As I Am” was released on November 7th 2017, and it features new music by women composers. Through this project, she was invited to present recitals at various festivals and events including the International Women’s Brass Conference and the Women Composer’s Festival of Hartford. As a composer, Kate wrote the title track of her debut album and continues to write other works, most recently composing a duet for trumpet and alto flute. In addition to advocating for female composers, Kate is also very passionate about increasing diversity and representation in the women’s brass community. She is a co leader of eGalitarian – an ensemble of women brass players playing music by women composers and advocating for women in the community. She is also half of the team behind Brass Chicks – a blog dedicated to celebrating the work of female brass players with guest posts and interviews. As an educator, Kate enjoys teaching private lessons in her own studio and as an Adjunct Instructor at New York University.